Today Twitter starting to roll out a change that makes it easier for you to report threats that you feel may warrant attention from law enforcement. 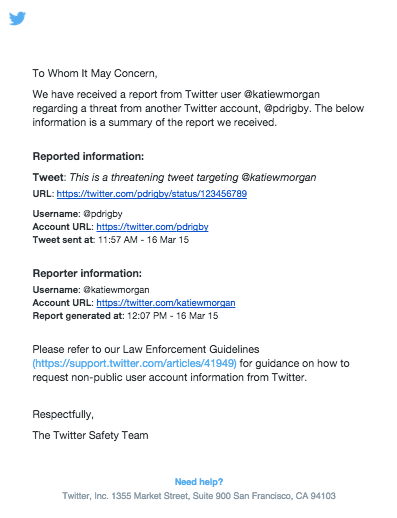 Here’s how it works: after filing a report regarding a threatening Tweet directed at you, you’ll see an option on the last screen to receive a summary of your report via email. Clicking the “Email report” button will send you an email that packages the threatening Tweet and URL along with the responsible Twitter username and URL and a timestamp as well as your account information and the timestamp of your report. Our guidelines for law enforcement explain what additional information Twitter has and how authorities can request it. While Twitter takes threat of violence seriously and will suspend responsible accounts when appropriate, Twitter strongly recommends contacting your local law enforcement if you’re concerned about your physical safety. They hope that providing you with a summary of your report will make that process easier for you. Finally, they’d like to acknowledge their safety partners, like the National Network to End Domestic Violence, for their feedback on this feature. Their input continues to be extremely valuable to us as we refine our reporting process so that it’s more efficient and useful.